Many companies now offer real estate agents a system they can use to stay in touch with clients. These “all in one” CRM tools perform automated follow-up campaigns, send email on important dates, and even handle the ordering and distribution of post cards, free market reports, and friendly reminders. However, we still hear from many agents who send their own newsletter directly from their email program. At best, it’s a hassle. At worst, it often ends up exposing an agent’s entire contact database when they accidentally cc: their list instead of using bcc: (blind carbon copy). Unfortunately, many agents can’t invest the monthly fees professional services require. Not to worry, though… we have a powerful, free alternative. 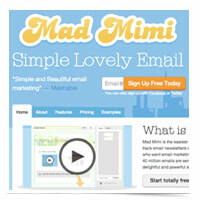 If you’re still sending out a newsletter the old-fashioned way, you might want to check out a free, user-friendly email newsletter service: Mad Mimi.